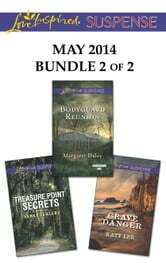 Love Inspired Suspense brings you four new titles for one great price, available now! Enjoy these contemporary heart-pounding tales of suspense, romance, hope and faith. This Love Inspired Suspense bundle includes Bodyguard Reunion by Margaret Daley, Grave Danger by Katy Lee and Treasure Point Secrets by Sarah Varland. More of the suspense you love-now Love Inspired Suspense brings you six new titles, in two convenient bundles!